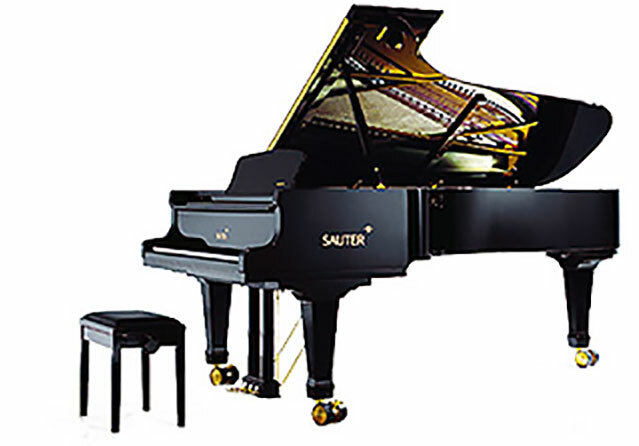 Brilliant, clear sound is a hallmark of SAUTER pianos. That is why we insist on hand-crafting our instruments—given that our clients have appreciated this beauty in tone for nearly 200 years. First-class components of the string attachments, such as agraffes and pins, which are precision-manufactured using brass or steel, while the attachments in the 275 CONCERT and OMEGA Plus concert grands are actually made of pure titanium. 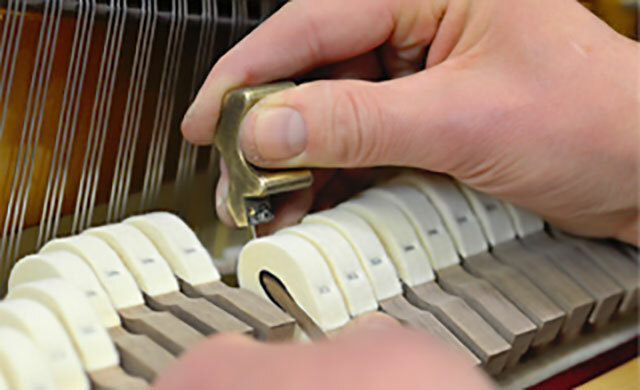 All tone-related components are individually designed, developed and manufactured for each type of piano. 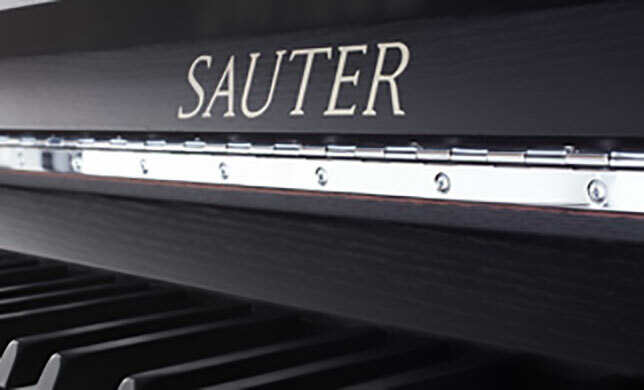 The secret of SAUTER's distinctive tone is the special "SAUTER spherical concavity®" of the sound boards in all upright and grand pianos designed by SAUTER. This permanently stable and tone-enhancing hollow is imparted using a unique manufacturing process, which can only be mastered through years of experience. The sound board is made of uniformly grown spruce wood from low mountain ranges and Alpine regions, which is particularly strong, yet light and flexible. The forms and positions of the structural slats are crucial for the precise concavity. They are glued together in one form and under immense pressure, to the sounding board, thereby stabilising the concavity, which then ensures they remain that way, without wanting to revert to their flat form. This imparts the desired membrane effect, creating the instrument's enduring clarity of tone. 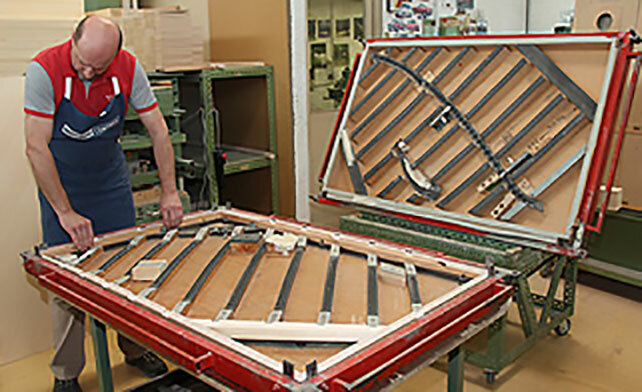 Researched and developed over many years, the manufacturing process used to fabricate the sound board is one of the defining characteristics that make the SAUTER sound uniquely lively and bright. The energy from the vibrating strings is transmitted by the bridges glued to the sound board. The strings rest on these bridges with a specific pressure and are secured with pins so that as much vibrational energy as possible is transmitted to the sound board. It is the fine-tuning of the actual string thickness, tension, and pressure on the bridge that determines the character and expressivity of the tone. If just one of these components changes too much over time—the concavity, for instance—then the soul of the sound is lost. The strings are made of high-quality steel alloys, which cannot be too hard or too soft. The bass strings are wrapped with 99.9% pure copper in order to achieve the necessary physical mass. 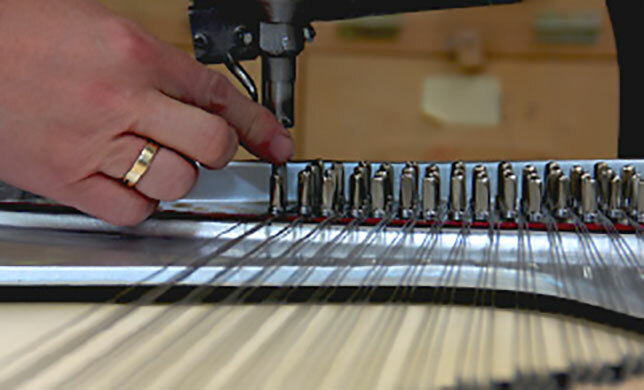 To guarantee quality, we produce the strings ourselves in house. The cast-iron frame (or cast plate), which we manufacture ourselves, must permanently stand up to enormous tensile forces of more than 20 tons exerted by the strings without bending or resonating. This can only be accomplished by an elaborately constructed cast-iron frame of the best workmanship, combined with a precise design such as that used by SAUTER. The sound board is firmly attached to a strong notch. A notch is a heavy timber-frame construction at the back of an upright piano or on the underside of a grand piano. This allows the sound board to vibrate freely and the notch to repeatedly reflect the vibrational energy, thus prolonging the sound. Unlike in the rational art of engineering, subjective feeling plays an important role in the manufacture of pianos. The piano manufacturer must first decide what he wants his piano to sound like and then seek ways to achieve that goal. The first step is to draft the string scale, i.e. lengths, cross-sections and tensile forces of the strings. This is the foundation of a piano—its genetic design, so to speak. 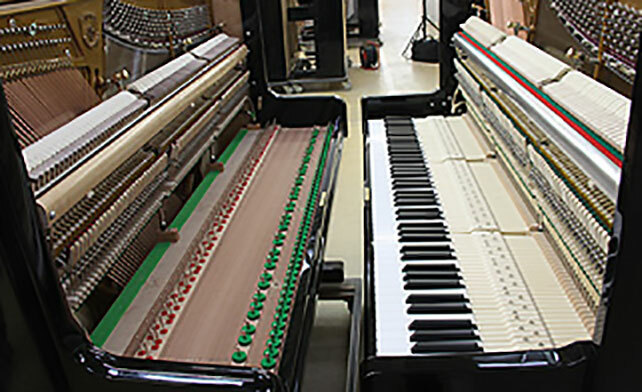 Although computer programs are often used today to calculate the parameters, this core area of piano manufacturing includes a wide range of empirical tasks that require great musical sensitivity and substantial experience. These abilities, along with nearly 200 years of tradition, give SAUTER upright and grand pianos their clear and unmistakable tonal palette. The hammer heads are not only the interface between the musician and the sounding body, but are also involved in the tonal design and therefore an integral part of the instrument's musical expressivity. The thickness, texture and shape of the felt, the haft and core of the hammers, and the method of bonding all play a part in determining the spectrum of overtones and, thus, the musical characteristics of the instrument. The optimum combination of factors cannot be calculated; it only can be achieved through intuition and experience. 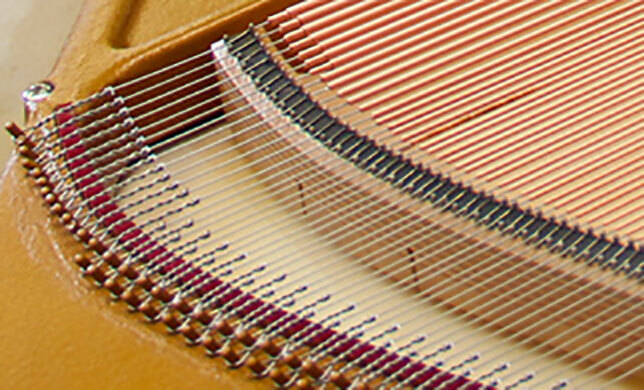 The SAUTER piano makers voice the hammer heads using thin needles and ultra-fine sandpaper to create the unmistakable SAUTER sound in each and every SAUTER piano. In addition to skilled craftsmanship and experience, musical intuition is also essential to this process. Only a finely voiced instrument can entirely unfold its sonority and respond to the pianist’s nuances in playing. 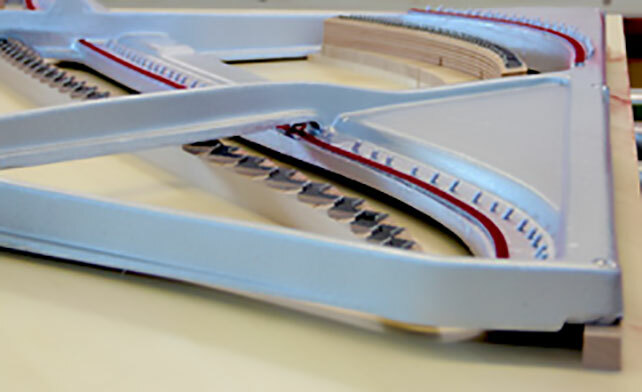 SAUTER was the first piano manufacturer to introduce the modern steel reinforcing frame, which prevents any warping of the keyboard mechanism. As the most important part of the instrument, the role of the action is to take the energy generated by striking a key and to transform it into vibrational energy as precisely as possible by means of the hammers. Good pianos are rich in overtones, which develop according to the intensity of the strike. This is the source of expressivity. It is therefore of great importance to anyone who plays the piano to develop their touch in order to take advantage of the instrument's diverse tonal palette. This is only possible with a perfectly designed action that has been fabricated with the greatest possible accuracy and properly regulated. 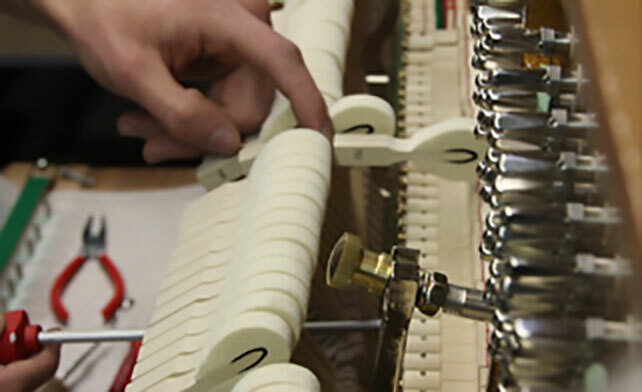 Anyone visiting the SAUTER pianoforte workshop will appreciate that it takes more than just craftsmanship to put together more than 6,000 pieces of wood, leather, felt, and metal into a single mechanism for creating a sound with no musical limits.